Jimmy Iovine has worked as a producer with everyone from Bruce Springsteen to Lady Gaga over his 40-year career, and is currently chairman of Interscope Geffen-A&M. As a second, or companion, act he cofounded the popular Beats by Dr. Dre headphone company in 2006 because he thought the iPod earbuds were terrible. "If Beats did anything, it got kids interested in audio again. We turned an entire generation on to sound," Iovine said in conversation with Walt Mossberg at the AllThingsD Dive Into Mediaconference here. But his third act is even bolder -- taking on Apple iTunes, Google Spotify and other music subscription services. Iovine has 100 people working on what he described as a "curated" music subscription service, called Beats, that he expects to launch this summer. "There is a sea of music, an ocean of music and absolutely no curation for it. You friends can't currate for you. 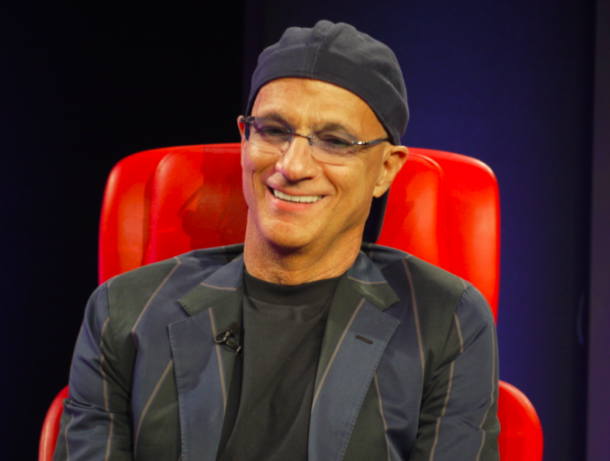 No one knows what song comes next," Iovine said. "Apple knows a lot about your music taste. Google knows a lot, and Facebook. But no one is using it to curate." For Iovine, knowing what song comes next is essential to the music listening experience. "No one listens to one song," he said. Iovine worked with Springsteen on "Born to Run," spending months working to put eight songs in the perfect order, and he believes that iPod shuffle and purely math-driven playlists don't present music in the right way. And, as with headphones, he believes that only people who come from the music culture can crack the code for a music service. "You want a trusted source to make a list with you," Iovine said. For that service, Beats will likely charge around $10 per month. Songza, a free streaming music service, also offers what it calls expert-made playlists for a variety of occasions. Iovine has enlisted music masters--artists, DJs and others with deep knowledge and experience in producing music--to create lists for a variety of music listener archetypes and situations. Beats bought the MOG music service last year as a foundation for the new service. On the business side, Iovine has a larger vision than just curated lists for the masses who are going to the gym or commuting. The service could integrate ticket and merchandise sales; include photos, videos and other content associated with the music; and give artists more direct access to their fans. Iovine hired a CEO, Ian Rogers, the former head of Yahoo Music and Topspin Media, to bring Beats to life and also recruited Trent Reznor of Nine Inch Nails to focus on protecting the interests of artists. iTunes, Amazon and other services don't give artists the option to connect with fans buying or listening to their music. Music was a $41 billion business in 2001, Iovine said, but now it's only about $17 billion. "We are not getting back to $41 billion...iTunes needs a step forward. Iovine is taking that forward step with Beats, counting on longtime music industry connections, superior curation and a more equitable ecosystem for artists and labels to succeed where others have failed.